Our pool is private and for use by owners and their guests ONLY. All users must access the pool area with a key. Please do NOT open the gate for individuals outside your party. Powder Village Rules and Regulations are located in the Governing Documents tab. Register your pet(s) to receive the required plastic pet permit tags. You must clearly display your pet permit tag when your pet is on the grounds within Powder Village. Please remember to clean up after your pet(s). Owners will be fined for any unregistered pets and/or pet waste that is left on the property. Registration forms can be downloaded from the forms tab to your left. Glass of any kind is NOT allowed inside the pool/spa enclosure. Please inform all tenants and guests of our smoke-free status. Smokers are fined for each and every smoking violation! Owners ARE responsible for the conduct of their guests/tenants. It is each owner's responsibility to ensure that their guests and tenants are aware of and abide by all our HOA Rules and Regulations. 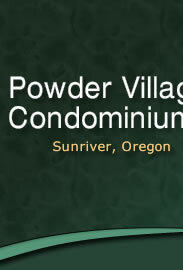 Board Secretary- Cascadia Management Inc.
Cascadia Management, Inc. is now serving as the HOA manager for Powder Village Condominiums. (541) 617-3863. New! All bicycles must be removed from the common areas by November 1. Abandoned bikes will be removed from the property and discarded. Our Bylaws do NOT permit for personal items to be stored in the common areas. Owners and tenants who live onsite full-time may apply for 1-2 covered bike storage permits. Forms can be downloaded from the Forms tab to the left of this page. *Note: The percentage that each size unit pays was laid out when the condominiums were first incorporated and is recorded in our Declaration Document in Exhibit E (Allocation of Common Expenses).